The movie poster is a unique seduction tool that is designed to relieve audiences of any ability to resist seeing a given film. An essential product of feature film promotion, unlike the movie marquee its sphere of influence extends beyond specifying what screen based dramatic performance will occur within the movie house, who are the main stars, and when it is playing. The movie poster is responsible for activating the viewer’s since of curiosity, remind them of potential wonder, and demand that they place the coming event on their and within the theater’s schedules. How does the poster do all these things, it uses a hundred plus years of visual gimmicks, provocative scenarios, narrative suggestions, visual effects and stimulating language to relieve the theater fan of their capacity choose another past time. After a crude initial range of advertising methods (including the use of the sandwich board) some pioneers of the field started to become recognizable. “Jules Cheret, considered in the advertising world as the father of the modern poster, is also credited with bringing the movie poster into existence. 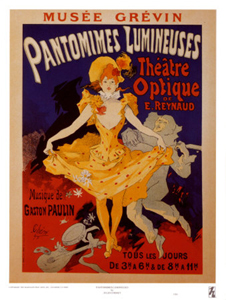 ” Jules Cheret “Pantomimes Lumineuses” poster can be found here. Fine art Impressionist fans might recognize a resemblance to the painting of seminal modernist artist Toulouse Lautrec. This semblance purely helps us understand how ideas used by other forms of entertainment initially helped sell the still new invention of feature film then frequently referred to as the “pantomimes lumineuses” as it was in France. Yet notice like Lautrec’s advertising of the Follies Bergere Revue, Cheret tended to advertise film exhibition events and showcased institutions not actual films . 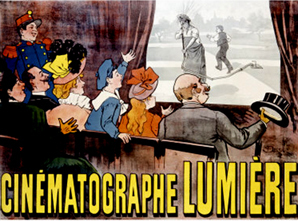 In 1896, Marcellin Auzolle designed the first actual poster for a specific film, actually containing scenes from the program, for Lumiere’s film entitled “L’Arroseu Arrose” . Refinements in thematic representation would naturally eventually follow over many years. 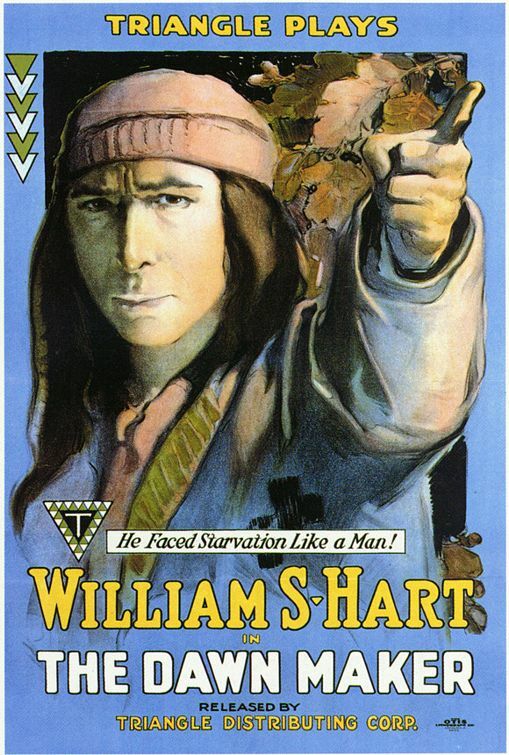 Some years later, if one looks at the conservative layout of an early poster like 1911’s “Snare of Society” you can see how graphically juvenile the genre was at that time. All you see is a simple title that stands out from the background image that you might see in any theater stage play. Other than what looks like a small trademark in the lower right hand corner, no attempt was made to be any more dynamic with other forms of discrete information. 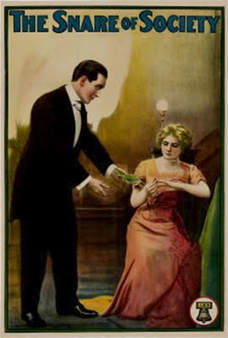 Posters still do not signal that they are a unique form of dramatic entertainment different from traditional theater . 1911’s “The Snare of Society” can be found here. Thanks to Laemmle, Actors and directors would eventually become on posters what they already were on movie marquees. …In return the stars agents demanded clauses in their contracts that would specify the size and placement of their client names on the movie posters”. 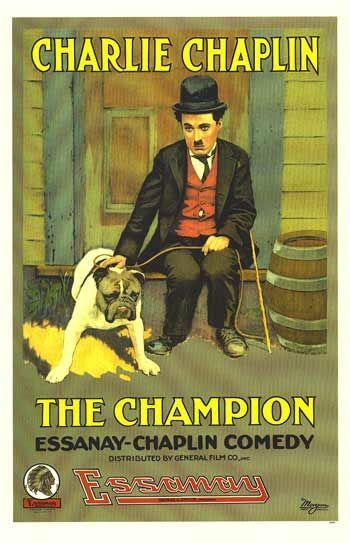 1915 “The CHAMPION” can be found here. 1916’s “The Dawn Maker” can be found here. The Marcellin Auzolle “L’Arroseu Arrose” poster can be found here. 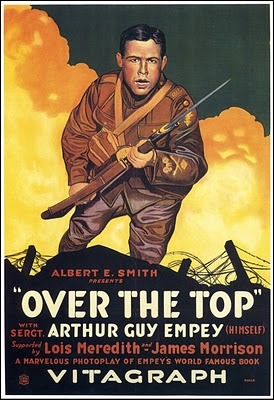 Over the Top, 1918, Wilfrid North can be found here. 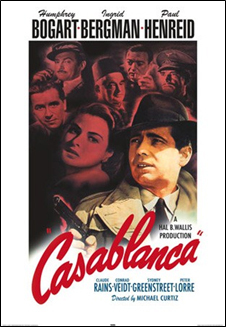 Bill Gold’s 1941 poster for “Casablanca,” utilized a narrative strategy lecturer Victor Moreno calls “Single Image Narration.” Though many would complain in later eras about this strategy (today when occurring on a black background some call it “floating head syndrome”). Yet at the time it was an excellent way to fore tale a narrative using background image portraits . The Bill Gold ‘Casablanca” poster can be found here. Some consider Bob Peak the father of modern poster illustration because of his distinctive and highly realistic painting style . The Bob Peaks ‘Raiders of the Lost Ark” poster can be found here. A favorite of Steven Spielberg, The Richard Amsel’s work was produced in colored pencil . 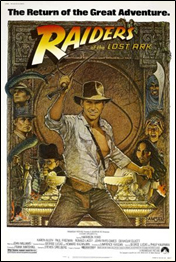 The Richard Amsel’s “Raiders of the Lost Ark” poster can be found here. 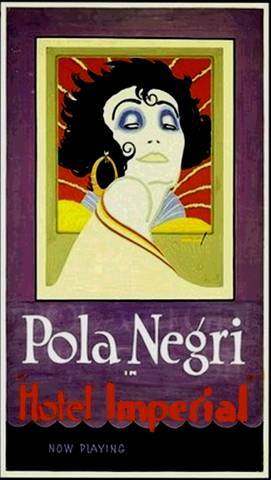 As poster design art matured more posters would rely more heavily on photography rather than painted or drawing media. In the last few decades computer graphics technology in image development and layout also would become far more popular. Yet this form of advertising has rarely failed to provoke the interest of film fans and other hungry consumers . Posters for “The Recruit, The Interpreter and Bad Company” can be found here. Posters for “Hitch,” “Sweet home Alabama” and “Bad Company” can be found here. Posters for “Alexander,” “Collateral Damage” and “Hart’s War” can be found here. Because millions of dollars can be lost on poor ad campaigns many advertising agencies are choosing to execute what would all “scatter shot campaigns”. Meaning instead of choosing one definitive way to sell a film many posters will be created waiting for a later time to make a distinctive selection   . Posters for “Bugsy” can be found here. Posters for ““For Colored Girls” can be found here. Posters for “Harry Potter and the Deathly Hollows” can be found here. I am blown away! Absolutely fantastic and incredibly interesting! Well I think I was a little too ambitious, yet your compliments are always appreciated. Shockingly for me, the more I learn, the more this topic keeps on giving. CR- Really excellent research and conclusion to this film poster series you’ve done. I do have a few questions. One I will give now and the others I will wait until the discussion tonight. U mentioned studios did not want to put actors names on posters initially. I can see why. I mean the poster is the first interaction an audience had with the production. The name on the poster and trailer dictates who’s carrying the weight of the film. Whoever appears on the poster first gets the most blame or applauds would u say? I don’t want to keep hammering on studio bean counters (better known as business men) that they frequently are so hungry for the attention that they inadvertently try to undermine actors and directors. And let’s be honest whose work are we really looking at? I don’t have anything against businessmen doing things most would consider mundane should be executed by these professionals. I don’t doubt that some creative’s have tried, but activities like working out product placement deals and visibility plans with product manufacturers,specifying payment programs for actors, specifying development budgeting for design developers etc. are extremely important necessities for film projects. Furthermore, it was poster politics that brought all of these things to our consciousness. CR-In your article u discuss different ad strategies. Do u think certain ad campaigns like the floating heads and close-ups are aimed at young adults? Where as the complex background that cater to a characters situation within the story are geared toward an adult demographic? Unfortunately, I could not show every poster that used this strategy. “Casablanca”, and I doubt “Enter the dragon”, and many others probably were not marketted to children. Yeah, I know. IMO film audiences have become more sophisticated and expect to take in a lot of information at one time. It seems the head shot or close up of an actor against a flat background is somewhat juvenile. For example adults today will recognize if a poster has a 60’s, 70’s or 80’s style to it and can read multiple genres and styles within a poster etc… Does that make sense? It makes a lot of sense. TV Tropes.com agrees with you explicitly. This is what they said……..
A derogatory term referring to the tendency in modern Film Posters and DVD cover art to have a black background with the faces of the lead actors above the name of the movie. Ubiquitous once the age of photo editing software came about, since it meant studios no longer had to commission an artist tens of thousands of dollars to paint a poster for them, when they could just take stock photos of the lead actor and have interns run it through Photoshop. 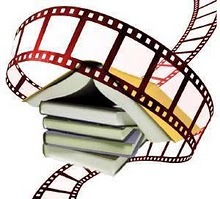 Generally felt to be a lazy approach, as it requires little in the way of creativity and imagination, and leads to many DVD releases looking all but indistinguishable on the shelf. Would you like to make a proposal in regard to conquering these aesthetic conventions? I really like highly conceptualized designs they are my all time favorites. For example the Blood Diamond poster featuring just a diamond dipped in blood against a black background. No scenic background or actors featured requiring audiences to ask questions and ponder etc… Excellent. Now not all actors names are well known enough to get away with this conceptualized design campaign but it is very interactive and effective. If u are going to do floating heads. I think doing something like “The Departed” is very interesting. I must say. I really loved the ad campaign for Cosmopolis from the trailer to the P&A were all very sophisticated. It had multiple genres within the poster for example that pink typography was very 90’s. Ooow, thank you for that snippit! I always thought of it as boring myself but I was wondering why professionals thought the same or worse. Welcome new and returning visitors to our discussion tonight. Feel free to lurk or join in on the discussion. Hi CR and OB and everyone! You’ve asked some great questions OB. I’m going to have to figure some out myself. No problem take your time LB! 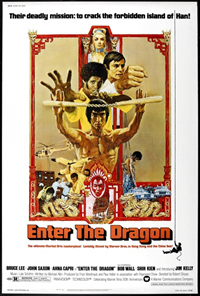 Do u see film posters today as potential collectors items? I don’t know what was wrong it would not let me sign in!!!!!!!!! U should be fine now CR! Most of these won’t be valuable. IMHO the public probably only associates the franchise with the three main characters played by the three main actors. The film posters I think will be of value are Lord of the Rings, Twilight and Harry Potter film posters. Simply due to their pop cultural significance. Though you maybe correct; I think rarer independents are likely to have greatest demand. For instance historical movies and political discussions specific to our time. That is so true! Do u think the Obama film poster is an example of what your talking about? Possibly, especially if he loses. Twilight??? Ewwww…none, I mean NONE of them were good. They looked like they advertised for constipation. I guess there is a nauseating quality about them, but (as a compliment) the cast holds up pretty well anyway. Strong genes seem to go a long way when your assaulted by photographers and makeup people. Hahahahaha! Hmm! I tend to agree with u LB. Not very sophisticated at all. The collectibles and memorabila market is huge. I’m sure many contemporary posters are just as sought after. True! I think any print media posters especially produced in the last decade will be a huge collectors item. I don’t even want to discuss Dark Knight Rises and The Avengers. Come on!!!!! For “the Dark Knight”, Heath Ledger was one of the few actors who won an Oscar post humonously. “The Avengers” I think is one of the third highest grossing films ever. These credits might increase the value of their posters. “humonously” = Sorry meaning he was deceased when he won. What film posters (produced this year) do u think will be valuable in 10 years? and to piggy back and on that question, what do you think the future of posters will look like? I know internet is taking over, but even the internet needs movie ads. I think film posters will eventually become digital even at movie theaters. I really think any film poster produced today should be collected due to advertising on the Internet. This has already happened. During SWATH’s run any attempt to pull up an article on a Twilight cast member (at a major commercial site) would bring up a Swath digital poster. Urgh, that annoyed me so much! I was looking up info for where Cosmopolis was playing and it had in the box “Things like this” SWATH! Apart from the two stars being in Twilight, they have nothing in common. At the moment I’m hating amazon’s “people who bought ths, also bought..” box! I wish there was a way to turn it off or at least custom it. Ozzie we’re eating the same Captain Crunch and barfing up the same prize…. Bwahahahahaha! I love that expression! And I got another laugh, thank you! With the end of the iconic film poster. One of the major problems I see for actors and directors is the ability to claim top billing. Also, so many fans are making there own advertising for films it’s hard to distinguish what’s what? I mean it’s nice to see a cohesive and sophisticated ad campaign. After all it can be the first impression u have with an audience. I think fan fiction and it’s media cousins are an acquired taste. So very true. I have seen very professional posters that later turned out to be fan made. Do either of you have a poster design u prefer more? I really like the Argo posters. Each year the IMP awards treat poster design like the Oscars. Had massive technical problem, getting caught up…..
Oddly, many posts that I attempted to register an hour ago are now present. It’s O.K. and probably nothing you could have helped. Why do you believe Poster designers are never embraced by the adminstrators, cast, and crew of a specific production? I would not go as far as to say NEVER. I do think P&A is something most studios like trailers are outsourced to various marketing firms. Whoever comes up with the best campaign wins the account. However, studios will and do work with multiple marketing firms for one film. Especially, if it’s a blockbuster film. I think I meant NEVER presented together as being part of the same team. There are many movies that are largely made by the costume designer’s work and choices. Why do you believe these participants don’t get poster taglines or top billing? Costume Designers have shown up on film posters if the film is a big period costume film. Also, academy award winning costume designer show up on posters. Thank you. I believe they are always in the poster credits. But I will look harder for their poster props elsewhere. I did not know that so I’ll look out for it next time! What is your favorite poster ever and why? Hmm! This is a good question. I will have to come back to it later. I’m very partial to characters in action or in a situation in the story. I like ads that sells the story not the actor alone. Does that make sense? Hi all! Sorry I’m late. Multiple tv signal malfunctions! Still not mangaed to fix it fully but I’m giving up for now! Bad TV malfunction. I’m sending u a cyber toaster oven. Hahaha!!!! There is still some cyber crochet oven mitts for u OB! Oh! Wonderful…… just in time for winter. Love it!! Hey! My cyber oven mitts. They aren’t BD2 special editions are they? Bwahahahah! Thanks for the laughs, I really needed it! I think I nearly had cartoon steam coming from my ears lol! Ah! I’m glad we lifted your spirits. Thanks Ozzie. I had similar technical problems. Glad you made it. Why do these things always happen when you’re busy?! It’s Sod’s law! Thanks for coming everyone. I appreciated all the great questions. I’m going to head out as well. This was an interesting discussion I learned a great deal. TC! Because I may not be the only person who is having problems with your link, I am posting another. And I can never disagree with Nolan either myself. The available alternatives to the most well-known poster are just as amazing. O.k. here are my list of favorite P&A campaigns. U may see a pattern but many of them selected are from Leo Dicaprio’s films. I don’t know but the guy seems to have an eye for P&A for his films. However, I will start by listing my non Leo films. Yet at least two of your preferences (“The Aviator”, and “Black Swan”) are presented in the same format. I may not have made this clear in the article but celebrity actor appearances really do sell films more than metaphors. You are entirely entitled to your opinion but don’t you think these artists hands are tied regarding this marketing challenge and convention? Hmm! What a pickle I’ve gotten myself in. LOL!! Well I do have a good explanation for this CR. The main quality that’s appealing in both these close up head shots of Black Swan and The Aviator. Is the contrasting narrative within the visual display and title. For example, for Black Swan we have the focus on the actors eyes suggesting something dark and mysterious. Plus u have her dressed as a Ballerina yet she looks pretty scary. So there are so many contradictions that draws an audience to the story and film just in that close-up alone that makes for a very sophisticated poster. Lol now looking at the Leo films they are also Martin Scorsese films. 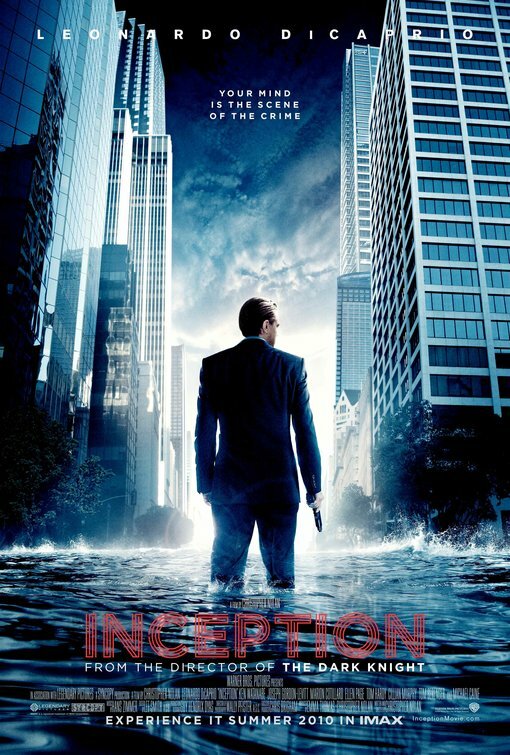 The only one that is not is Inception. I can’t disagree with you regarding Leo; he’s a monster in most categories. For an actor he really doesn’t leave much to chance. But I agree we have to tip our hats to Scorsese also. As your list demonstrates the better directors cross their “T”s and dot their “I”s. And it’s remarkable to see how culturally well-rounded, astute, and well versed all of these film professionals are in other creative endeavors.